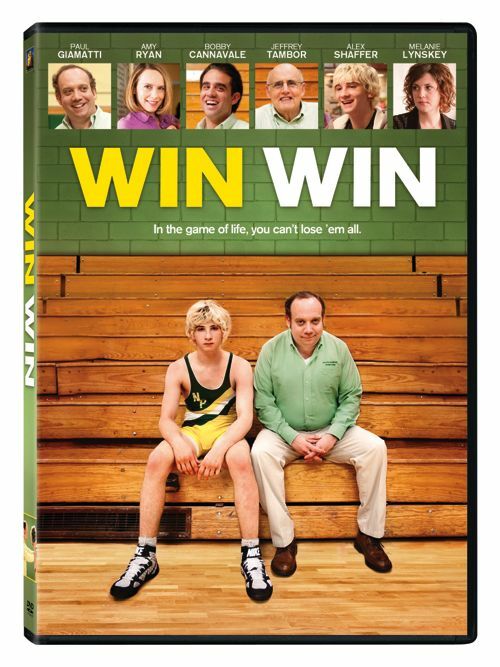 Academy Award® Nominee Paul Giamatti stars as a lovable yet long-suffering lawyer and high-school wrestling coach who takes us on a brilliantly heartfelt journey through the game of life…where you can’t lose ’em all. When Mike Flaherty (Giamatti) comes across a teenage runaway who also happens to be a champion wrestler, Mike’s luck turns around in spectacular fashion. But his win-win situation soon becomes more complicated than he ever imagined when the boy’s family affairs come into play. Co-starring Oscar® Nominee Amy Ryan and directed by Oscar® Nominee Tom McCarthy, this touching and funny comedy will leave you cheering. Win Win is a film about how good people can sometimes make bad decisions. Paul Giamatti plays attorney Mike Flaherty, a married father of two and part time high school wrestling coach of a losing team, who is suffering from panic attacks and a failing law practice. An opportunity to make some money by becoming the legal guardian of a client in the early stages of dementia is an easy fix, though morally questionable. Not soon after having been moved to an assisted living facility against his wishes, Leo’s long lost grandson, Kyle Timmons arrives on his doorstep. Kyle turns out to be a championship wrestler and suddenly Mike’s poor judgement becomes a web of half truths that complicate every aspect of his life. McCarthy’s film examines the meaning of the concept of family, as both the impetus for Mike’s motivation and as a haven for several characters who become part of his expansive brood. There isn’t a single character or performance in the film that isn’t fully constructed, and results in a fully realized world on screen. The entire cast is outstanding, beginning with Giamatti, who gives a phenomenal performance. Amy Ryan is equally fantastic as his wife, Jackie. Other supporting performances of note include McCarthy regular Bobby Cannavale as Mike’s friend and confidant, Terry, Jeffrey Tambor as his assistant coach Vig, Burt Young as Leo, Melanie Lynskey as Leo’s estranged daughter Cindy, and Margo Martindale as her attorney, Eleanor. The real find is in actor Alex Shaffer who plays Kyle. A real championship wrestler turned actor, Shaffer delivers a fantastic first time performance and has a unique delivery that stays with you long after the movie ends. Extras include deleted scenes, interviews, featurettes and a music video. Win Win is the kind of film that every studio should be making and that audiences should be embracing. Unfortunately, that doesn’t always happen, but in the case of this film it does and you should seek it out. Win Win lives up to it’s title. And that’s pretty damned impressive.